The newly opened O Condos building is part of the $1.5-billion Zibi development, which has divided Algonquin First Nations because of its proximity to the Chaudière Falls. 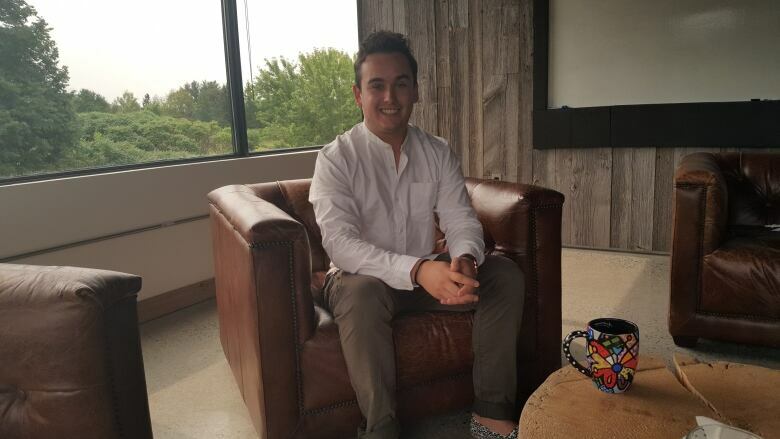 Marc-Antoine Massicotte nearly left the nation's capital, until a new development emerged on the banks of the Ottawa River. The 27-year-old event planner is among the first moving in Thursday to the newly opened "O Condos," a six-storey condominium at the site of the Zibi development, which spans both the Quebec and Ontario sides of the Ottawa River. "It was a lot better to have this kind of project on that site than to leave it as it was. All I've seen there is abandoned buildings and bricks and concrete and now we're starting to see the river, we're starting to see the trees," said Massicotte. 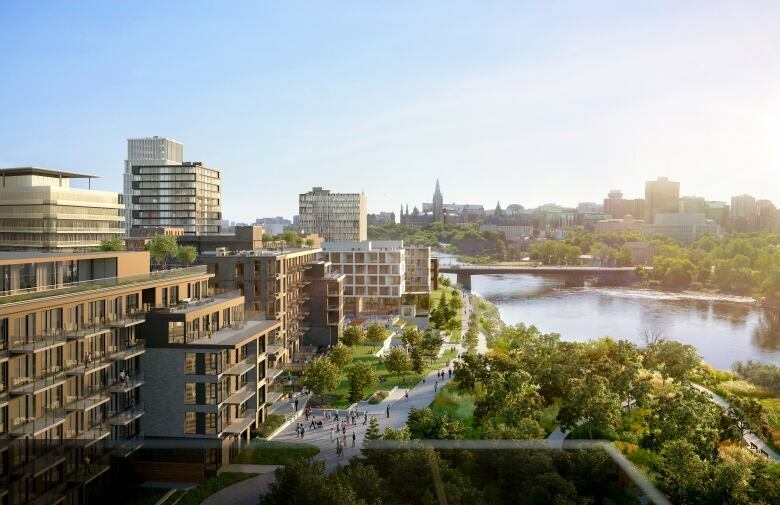 Eventually, 5,000 people will live in the Zibi community, just up the river from Parliament Hill on 37 acres of former industrial land, now prime waterfront real estate. The development is expected to be completed in 10 to 15 years. But the $1.5-billion Zibi development — which derives its name from the Algonquin word for "river" — has divided Algonquin First Nations because of its proximity to the Chaudière Falls. Critics say it is an affront to the government's promises of reconciliation. There have been public protests, land claims, lawsuits and appeals to the municipal board. 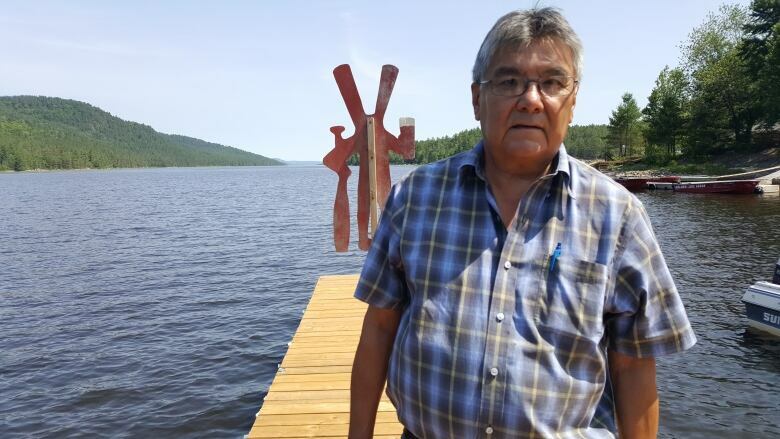 "Our people have been using that site for thousands of years, long before the arrival of the Europeans," said Harry St. Denis, the long-serving chief of Wolf Lake First Nation. "It has always been regarded as a sacred site." St. Denis died suddenly earlier this month. The islands around Chaudière Falls, where tobacco ceremonies were held, were a gathering site for Indigenous people. 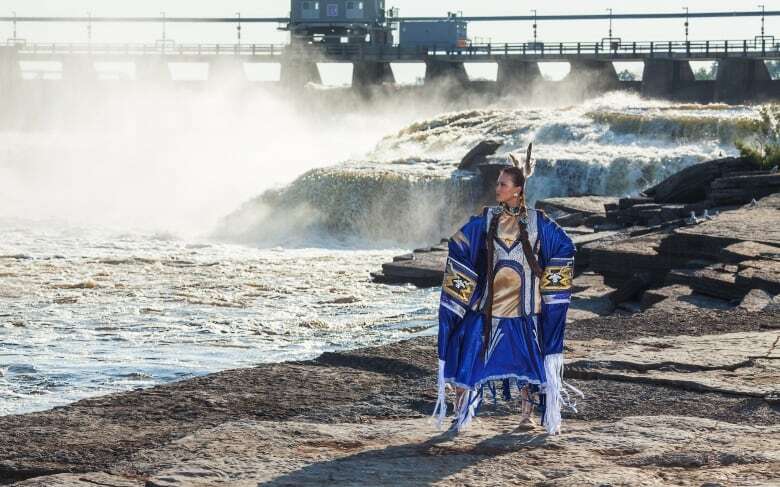 Located at the confluence of the Ottawa, Gatineau and Rideau rivers, the Chaudière Falls were referred to as the "Big Kettle" by Indigenous people and said to resemble a giant cauldron of boiling water. "It's an absolute gem of a part of our region that most people didn't even know existed. It's been blocked off and fenced off for so long," said Jeff Westeinde, president of the Zibi project. "You know, I'm ashamed to say it — I grew up in Ottawa and didn't realize this waterfall existed." Given the history of the site and its importance to Indigenous people, Westeinde says Algonquin input has shaped the project, starting with the name of the community. 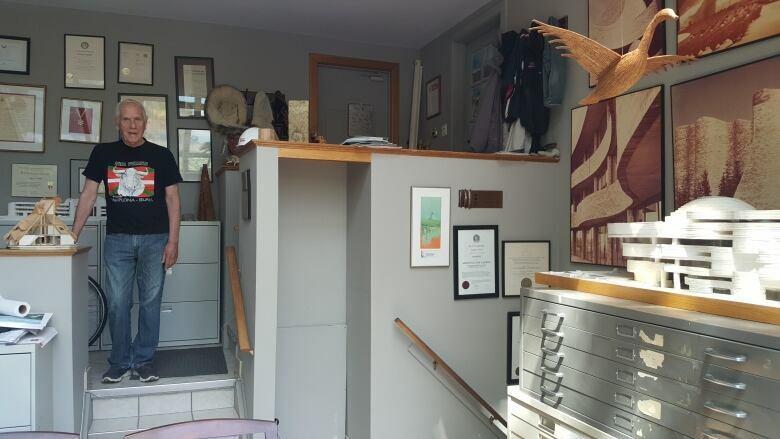 "We really wanted to celebrate the fact that this is Algonquin traditional territory," he said. Algonquins of Ontario (AOO), which represents 10 Algonquin communities, and Pikwakanagan First Nation, have benefit agreements with the developer, which include hiring students, retail opportunities on the site and equity ownership and investment in the project. Two other Algonquin First Nations have signed a letter of intent with Zibi to ensure opportunities for their people and the promise to "raise awareness about their people and culture in Canada's capital region." "We're looking for more than a plaque or street names," said Kirby Whiteduck, chief of the Algonquins of Pikwakanagan. He says the developer's approach represents a new way of doing things. 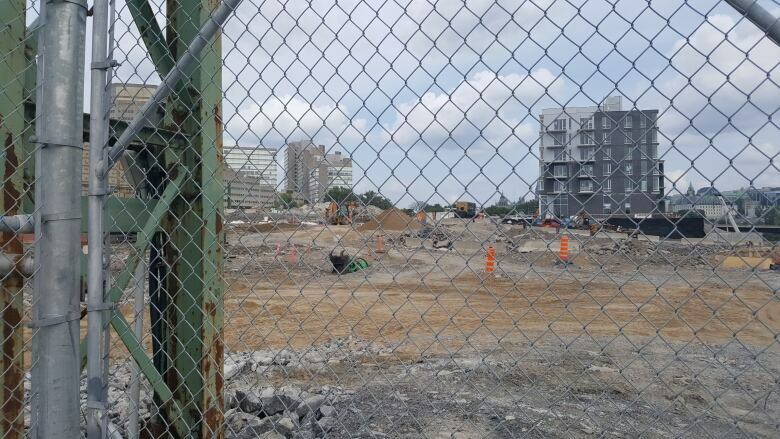 "As you know, in pretty well all private development that's happened — at least in Algonquin territory — there has been no benefit for the Algonquins," Whiteduck said. "So this is a new thing that we think could set a precedent." But St. Denis, who said Wolf Lake First Nation was not consulted, wasn't convinced the developer's arrangements with other Algonquin First Nations were meaningful. 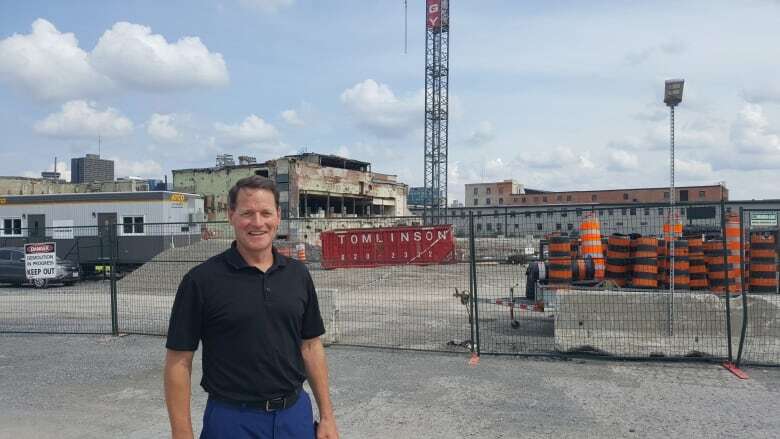 "I don't know much about them, but a big company like Zibi can round up people from anywhere and throw a few carrots at them and I think that's how they operate, that's how big business operates," he said. "I know they talk about, 'Well, we'll name some streets after Algonquins or whatever.' I don't give a damn about stuff like that. That's all tokenism." He added he was disappointed that the federal government didn't find a way to preserve the site for Indigenous people and the public. He said he expected more from Prime Minister Justin Trudeau, especially given the government's promises to prioritize reconciliation and "since their Parliament sits on our territory, our Algonquin territory." "How can we really believe that he means what he says when he lets something like this occur right out of his back window?" asked St. Denis. For Josée Bourgeois, the development is "reconciliation in action." She sits on Zibi's Memengweshii council, a small group of Algonquin women who suggest ways the developer can integrate their culture into the project. "This project, its vision, its goals are sacred, are reconciliation in action, are the answer to a Metropolis city that has struggled for many generations to reflect its First Peoples of the territory adequately," she said. Long before Zibi, there were other plans being made for the site. In the 1980s, Douglas Cardinal — the renowned architect who designed the iconic Canadian Museum of History — worked with Algonquin elder William Commanda to come up with designs for the islands in the Ottawa River. Commanda died in 2011, but Cardinal, until this day, has kept the drawings and renderings. "The islands in that site are our sacred area that evolved and was created by the Creator himself," the 84-year-old said. Commanda and Cardinal's plans involved turning most of Chaudière Island into a park, but they were shelved, in part, because of a lack of funding. "They were to be submitted to Parliament so that the land would be turned over to the Algonquins," Cardinal said. In the 1990s, the National Capital Commission (NCC), a Crown corporation, deemed the islands in the Ottawa River "a land mass of national interest." Another architect was hired and the NCC struck a tentative deal to buy the islands. But the Conservative government rejected those plans in 2012. The NCC did end up acquiring neighbouring Victoria Island and plans are underway to clean up the soil there and eventually build an Aboriginal Welcome Centre. But Albert and Chaudière Islands were sold to the developer and re-zoned for mixed commercial use in 2014. Construction began in 2017. "The people that are buying into this whole process are providing us all a lesson of how not to be and what not to do," Cardinal said. "You do not desecrate a sacred site. You don't build condos in the Vatican, in the centre of St. Peter's Square, because there's a lot of people there and 'Wow, I can make some money.' Or build a condo right on the wailing wall in Jerusalem." "You don't do that out of respect." Written and produced by Kristin Nelson. An earlier version of this story reported that two Algonquin First Nations have a benefit agreement with Zibi. In fact, one of the agreements is with the Algonquins of Ontario, which represents 10 Algonquin communities.